Beautiful engraved RARE specimen certificate from the yesmail.com dated in 1999. This historic document was printed by United States Bank Note Company and has an ornate border around it with a vignette of the company logo. This item has the printed signatures of the Company's President, David M. Tolmie and Secretary, David B. Menzel. Yesmail.com, Inc. provides direct marketing services to about 90 corporate clients, including AT&T and eToys. It sends out e-mail tailored to the specific interests of more than four million subscribers who use the company's My.YesMail system and have agreed to receive promotional materials. Yesmail.com pitches its "permission" e-mail as a more targeted alternative to online banner ads and traditional direct mail. Consumers elect to receive mail in more than 20 categories, including business, shopping and computers. On Dec 27, 1999, CMGI, Inc. agreed to acquire the e-mail marketing software producer, Yesmail.com, Inc., for $523 million. According to the terms of the agreement, CMGI will exchange 0. 1252 shares for each of Yesmail.com's outstanding shares. This deal valued Yesmail at $563 million, or $27.74 per share. 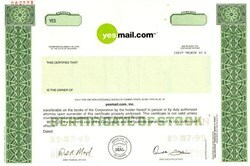 After the news was announced, shares of Yesmail.com soared $3 to $24, while shares of CMGI declined $6, to close at $199.75.